Hiking the Griffins Fire Trail is fantastic for the fitness. The track is 11km one way and offers steep up hill sections that run for almost 5km. Your heart will be pumping when you get to the top. Along the way you’ll come across some fantastic granite formations. It remained me a lot of the Granite Tors bushwalk in the ACT. There is also a camping option at Griffins Farm. It’s a nice grassy paddock along the creeks edge. There are ruins of the old farm house and plenty of wombats occupy this area. Making your way up to Meryla Pass will offer spectacular views over the nearby region. The total ascent for the trek was 922m. So you’ll differently know you’ve had a good workout when done. A car shuffle is possible as the bushwalk can be started from either Jacks Corner rd or Old Meryla Rd. Note that after heavy rain it could be difficult to make the creek crossings. All tracks are well sign posted on the Griffins Fire Trail bushwalk. Directions to Griffins Fire Trail. Google Map Link. Head down Jacks Corner Rd. Once the road takes a right angle stop there. That will be the start of the Girffins fire trail and is clear sign posted. 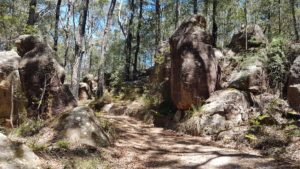 Griffins Fire Trail bushwalk Photo Gallery. Barren Grounds bushwalking Youtube Clip.